Cormac is a sophomore at Bishop O’Dowd High School and this is his second season volunteering at Cal Shakes. Volunteering primarily at the Bruns, Cormac has sold raffle tickets, distributed programs and blankets, and helped audience members participate with the Triangle Lab. Read on to learn more about Cormac and his special talents, summer vacation, and what his dream Shakespearean role is. Where are you from? I was born and am being raised in Oakland. This is an adventure in itself. I have two younger sisters, one is 10 the other is 13. They bicker when they play, which continues to confound me. My father, a former journalist, runs our family packaging business. My mother is in charge of design and marketing for our business and is a gifted photographer. What do you like to do in your spare time? Time is spent reading historic fiction, history and practicing French. I just completed The Gates of Fire by Steven Pressfield about the Spartans at Thermopylae, which I loved. Presently, I have the good fortune of writing this from the base of the French Alps. Life is good. Do you volunteer anywhere else? I also volunteer at Fort Point, a Civil War-era fort beneath the Golden Gate Bridge. What’s one of your special talents? Speak any languages? Play any musical instruments or sports? I am gradually learning French, enjoy narrative storytelling, am blessed with a strong memory, and have a sense of humor. I can write a good essay if it’s about something I like. I can do an excellent Virginia reel. Also, I love European history and Shakespearean theater. As for talents, they’re still evolving. If you could be a character in any play you’ve seen at Cal Shakes, who would it be and in which production? Charles Condomine in Noël Coward’s Blithe Spirit. Cormac, thank you for being an important part of our Cal Shakes family! Volunteers are a vital part of our Cal Shakes community. With over 1,000 volunteers, our volunteer corps represents a wide and diverse demographic. Our volunteers hail from throughout the Bay Area, San Francisco to Pleasant Hill, to across the state, from Grass Valley to Los Angeles. They are mothers and daughters, fathers and sons, coworkers and friends. Volunteering with California Shakespeare Theater can be a great opportunity to experience and learn new things, spend time with family and friends, earn high school credit, fulfill community service requirements, see great theater for free, and, most importantly, pay it forward in the spirit of volunteerism. There are many ways to lend a hand at Cal Shakes, and signing up is easy. Interested in volunteering? Click here to register; once your application has been approved, you will be able to sign up for ushering dates and will be notified of other opportunities. Ellie is a valuable member of our Cal Shakes family and we’re happy to introduce her to all of you! Read on to learn more about Ellie, her not-so-fat cat, her organizational talents, and how Ira Glass cracks her up. Describe a memorable experience you’ve had volunteering at Cal Shakes: One time I volunteered to make buttons in the Cal Shakes offices. I needed a mat board for the project, and this really nice staffer helped me hunt for one. She wound up taking me on an impromptu tour of the building. I’d never been beyond the front office, so it was really cool to see where the amazing props and costumes in Cal Shakes’ productions were made. What’s a typical volunteer shift like for you? When I volunteer as an usher, one of my favorite tasks is to organize the chairs that patrons will pick up before going into the theater. The chairs are usually stacked on top of each other in a big jumbled mass, and sometimes it can be hard for patrons to quickly grab the number they need. But I’ve worked this volunteer job enough times to know the most common group numbers—like a couple who will ask for two chairs or a family who will ask for four. So l try to stack the chairs in easy-to-grab groupings, neatly arranged in rows, that makes the process a lot easier and faster. I also like to put out the nicest chairs in front so early birds get a benefit. How do you spend your time when you’re not helping out Cal Shakes? In addition to volunteering with Cal Shakes, I volunteer as an usher with Cal Performances, which I actually learned about from another Cal Shakes volunteer. And before I graduated in May, I did a lot of tutoring with young kids. My favorite organizations are 826 Valencia, Reading Partners, and Stories to Go. When not volunteering, I can be found at my local used book store, the Friends Corner Book Shop. I love to hang out with my friends, discover new coffee shops in the Bay Area, and watch unhealthy amounts of television—my current favorites are Suits and Covert Affairs. What’s one of your special talents? Speak any languages? Play any musical instruments or sports? I have a freakish talent for cleaning and organizing. Nothing makes me happier than to bring order to chaos, especially the chaos of people’s closets. I single-handedly cleaned and organized every closet, cabinet, drawer, and storage space in my dorm room, apartment, parent’s house, and grandmother’s house. I love to clear out clutter—one of my favorite parts of the show Hoarders is when the cleaning crews throw out all the junk! If you could be a character in any play you’ve seen at Cal Shakes, who would it be and in which production? I would be Elvira from Noël Coward’s Blithe Spirit, which I saw last season at Cal Shakes. Not only was the play hilarious, but Elvira was super entertaining as the dead and vengeful first wife who comes back to haunt her husband and his second wife. Fortunately, I’m not the vengeful sort, but it might be fun to wreak a little harmless havoc on my friends’ lives. What’s one the most exciting things you’ve done this year? I saw Ira Glass at Cal Performances, and he just blew me away with his amazing storytelling skills. I honestly can’t remember the last time I laughed so hard. Do you have any pets? I have a formerly fat cat named Chubby. Volunteers are a vital part of our Cal Shakes community. With over 1,000 volunteers, our volunteer corps represents a wide and diverse demographic. Our volunteers hail from throughout the Bay Area, San Francisco to Pleasant Hill, to across the state, from Grass Valley to Los Angeles. They are mothers and daughters, fathers and sons, coworkers and friends. Volunteering with California Shakespeare Theater can be a great opportunity to experience and learn new things, spend time with family and friends, earn high school credit, fulfill community service requirements, see great theater for free, and, most importantly, pay it forward in the spirit of volunteerism. There are many ways to lend a hand at Cal Shakes, and signing up is easy. From left: Melissa Smith as Mrs.Bradman, Anthony Fusco (partially obscured) as Charles Condomine, Domenique Lozano as Madame Arcati, René Augesen as Ruth Condomine, and Kevin Rolston as Dr. Bradman; photo by Kevin Berne. While on the subject of ghosts, you may like to know the origin of the word. Originating from the words, “gast” and “geist” (breath, spirit), ghosts beckon from the afterlife, alluding to unfinished business left on earth. In the 16th century “gast” became semiotically entwined with “ghastly,” while our contemporary “ghosts” commonly inhabit not only the physical space of figures who slip unseen between walls and onto stages, but also the lexical space of the psychological. Blithe Spirit, on our stage now through September 2, 2012. Click on the arrow below to listen to a podcast of a pre-performance Blithe Spirit Grove Talk, presented by Resident Dramaturg Philippa Kelly. Podcast produced by Will McCandless. Blithe Spirit runs through September 2, 2012. Box Office Manager Robin Dolan blogs about doing her first-ever Grove Talk, for Blithe Spirit. I’ve always wanted to do a grove talk: I’m one of those odd people who love public speaking; I also love an excuse to research and share knowledge. Last year I’d expressed this wish to Philippa Kelly, our resident dramaturg. When one of our speakers needed time off in August, Philippa offered me the opportunity for me to speak for Blithe Spirit. I was thrilled. Coward on February 2, 1939, drinking a toast with famous friends on the liner Monterey, on which he sailed from Los Angeles harbor for Pago Pago. 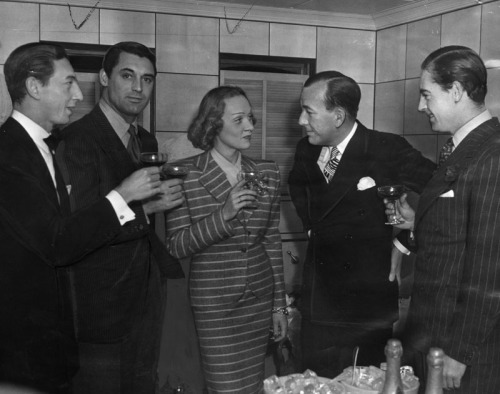 Left to right, Ray Bolger, Cary Grant, Marlene Dietrich, Coward, and Michael Brooke, the Earl of Warwick. I attended a family reunion in an English country manor in June—the perfect place to begin my research. I brought with me Clive Fisher’s bio Noël Coward, as well as Coward’s first autobiography, Present Indicative. I couldn’t finish the Fisher book, because it seemed obvious to me that he didn’t like Coward. He painted a picture of the writer as self-centered and fake. But then Coward’s autobiography seemed to reinforce that, being artfully written, but, well, focused on himself. I remembered I owned a collection of Coward’s letters; these opened the door to the real man. Coward’s letters are playful and engaging, and express a real connection to the people in his life. I was fascinated to learn that he corresponded with both George Bernard Shaw and Harold Pinter. Philippa asked me to do a practice talk with her, and we met out at the theater. Philippa was wonderfully encouraging, but suggested I emphasize a couple of facts. I also practiced at home, which must have been entertaining to my neighbors who could overhear me—there’s an Oakland School of the Arts theater student across the hall, so they’re probably used to it. I did my first talk Wednesday, and I think it went well. People laughed at the Coward quotes I included, and I think I shared a lot of good information. On e thing I regret: I was embarrassed to not know the answer to a patron’s question, and have since found the answer and hope to avoid that recurrence. To answer Wednesday’s question, Coward directed the original West End production of Blithe Spirit, but never performed in the play on the London stage or Broadway. He played Charles Condomine in a 1942 English touring production. Additionally, he directed and performed in a 1956 TV film of the play, also starring Lauren Bacall and Claudette Colbert; the latter’s interpretation of Ruth drove Coward mad. The note cards are written for the rest of my talks, but I continue to read Cole Lesley’s book because it’s so enjoyable. I also keep finding new fascinating facts about him. Come on out to listen at the Bruns on August 18, 22, and 28–30, and I’ll share some with you. Resident Dramaturg Philippa Kelly offers more contextual information on the writing of Blithe Spirit, on our stage now through September 2, 2012. 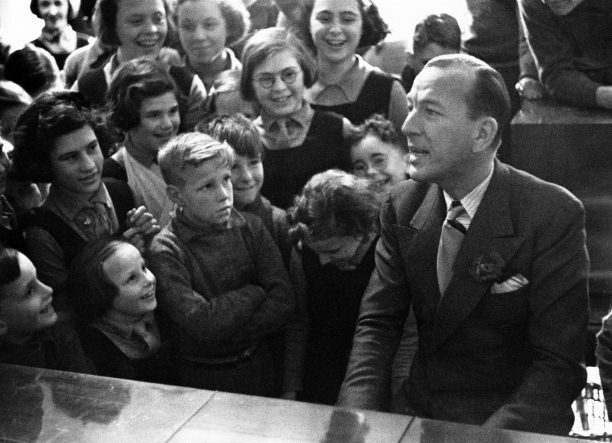 Coward visiting the Actors Orphanage, Chertsey, Surrey, where he was president, 1939. He arranged for all the children to be evacuated to New York the following year for the remainder of the war. Despite its having nothing to do with war, Noël Coward very much saw Blithe Spirit as a war effort, designed to lift the spirits of the London public. By 1941, he had been intensely involved with the war effort for the whole of the previous two years (thus spending two entire years away from his typewriter). He had been excused from most of World War I on medical grounds, and had gladly pursued his professional and social ambitions, ending that war as London’s darling. But by the time of World War II he had grown up, and had a real sense of patriotism. He served for a brief time as a secret agent in Paris and entertained the allied troops in Europe, Africa, and the Far East, often covering his travel expenses himself; he also made trips to America, to try to persuade the Americans to join the war. Soon after staging Blithe Spirit, he would go on to write This Happy Breed, a play explicitly imbued with nationalist fervor. By the time he sat down to write Blithe Spirit, Coward was in a whirl of creativity— he wrote it within five days! He set the play back in the 1930s, in Kent, where he himself had a house. During the war period Kent was actually deeply immersed in the war effort, with planes flying constantly overhead and inducing evacuations of women and children to safer parts of England. But in the ’30s, due to a massive renovation of England’s public rail system, Kent had been prized as an upper-middle-class urban idyll, pleasurably removed from the noise and bustle of London and yet easily accessible to it by rail for reasons of work, theater, and upmarket shopping. After writing Blithe Spirit, Coward sat back and said “This is the best comedy I’ve ever written.” He changed only two lines of the initial draft before the play hit the boards on July 2, 1941. It opened to 1997 consecutive performances, breaking West End box office records. Read the Blithe Spirit program and many more articles about our Main Stage productions at calshakes.org/articles. The following was written by Marketing & PR Manager Marilyn Langbehn. Stay tuned for more dispatches from inside rehearsals. Every Cal Shakes play has benchmarks on its path to the finished production our audiences will see on the Bruns stage. Last night’s benchmark, the designer run, marks the end of a specific part of the rehearsal process; tomorrow the company decamps for the Bruns and the start of tech rehearsals. For those of us who have not been a part of rehearsals, it’s a chance to see the journey the show has taken from the first benchmark—the Meet and Greet and first rehearsal only three short weeks ago. It’s thrilling to feel the energy in the room on designer run day. Lighting designer York Kennedy, composer/sound designer Will McCandless, and costume designer Katherine Roth sit across the room, in front of the taped-out playing area, waiting for stage manager Corrie Bennett to call places for Act One. Although many of the designers have been around for the rehearsal process, this is the time when they will focus on how their respective work fits into the overall production. Where do the actors move during the show, and what kind of lighting is required? Does the sound cue in that spot need to be recorded or done live? Stuff to be figured out during the course of the next week; what sounds and looks good in the rehearsal hall may play quite differently when it’s outdoors at the theater. Sometimes there’s a preamble to the run-through, a reminder of the rules of the room, but not today. Everyone knows why they’re there and are ready to begin. Corrie calls places, and we’re off. It’s immediately apparent director Mark Rucker has cast a group of artists who are intimately comfortable with each other, the play, and the work they need to do. The story unfolds seamlessly and with the appropriate suspense, even for those of us who already know how it turns out. Noël Coward’s delicious laugh lines land and, even without the benefit of some of the ghostly tricks that will come to fruition during the tech rehearsals, it’s clear that Coward and this company are creating something magical. Tomorrow begins the home stretch. I can’t wait to see how it all turns out. Blithe Spirit begins previews Wednesday, August 8; stay tuned for more blogs from rehearsal. Tickets are available at calshakes.org/tickets or by calling 510.548.9666. Philippa Kelly, resident dramaturg for Cal Shakes and production dramaturg for Blithe Spirit, shares her thoughts on the current production, and invites your questions. Blithe Spirit runs August 8–September 2, 2012. Photo of Philippa Kelly by Jay Yamada. In 1941 Noël Coward wrote Blithe Spirit, his gift to the war effort. By setting the play in the 1930s, Coward wanted to take London audiences out of the horrors of the blitz, death and privation, and back to a time of upper-middle class contentment. This is the setting for Blithe Spirit—Kent, near London, where Charles Condomine, a mystery writer, and his wife, Ruth, are getting ready to hold an after-dinner séance as research for Charles’ start on a new novel. They expect it to be a hoot, and, indeed, it is—but not in the way they imagine! Are you going to see our production of Blithe Spirit? Do you have questions or comments about the production’s music, cast, themes, creative choices, or anything else? Please leave them in the comments, and I’ll be sure to respond. The following was written by Blithe Spirit Assistant Director Megan Sada. Stay tuned for more dispatches from inside the rehearsal room. The production and artistic teams and cast are back from their break early in anticipation of today’s visitor to the rehearsal room. Much like the Bradmans and Condomines in Blithe Spirit, we are half skeptical, half wanting to believe. Unsure of what we should be doing, we stare quietly as the medium, Medusa, and her friend as they circle a table with 12 chairs around it, breathing heavily, almost running. Medusa swooshes the air in front of her every few steps, as if pushing something unseen forward and out of her way. The rest of us are in awe or just standing awkwardly, wondering what will come next. We are in our third week of rehearsals for Blithe Spirit. Since a great deal of the play deals with the materialization of a ghost after a séance, we are all curious about what a real one looks and feels like. Medusa introduces herself and asks us to all sit in the chairs. She tells us that we cannot get up or leave during the séance. She tells us that she doesn’t fake it, so that if the table is shaking, chances are it’s an earthquake. We take a deep breath and she begins to open a door to the “other side.” As most of us are unfamiliar, we do a great deal of wide-eyed looking at one another. Medusa is saying words I don’t recognize but which seems to be a call to the dead; when she does start speaking in English, she quite clearly says that those who only wish to do good or send a message for good are welcome in this space. She asks the volunteers—us—to say the names of their dead out loud. She then says that the group should repeat the name when she calls to them, as our energy will help them come forward. Robert makes Medusa nauseous. He apparently doesn’t approve of this séance and leaves. Yondel needs something. He needs to be lead. Ah…he needs forgiveness to pass. Forgive him? Yes. Harvey is laughing. Have a beer with Harvey? Yes. Harvey says firm love will help those who miss him. Billy loves you and is proud of you. You’re fulfilling your dream. We all dispersed in an odd way—those who spoke to their dead mostly leaving without saying much of anything, the rest of us exchanging whispers as we departed. The next day, we recounted our individual experiences, each admitting to moments of both questioning and believing. I think our experiences will inform the performance. It definitely helped Domenique Lozano (Madame Arcati) come up with some new ideas for the séance in Blithe Spirit. And, it gave her confidence in that some of her instincts were already spot on. One fascinating thing that Medusa told us was that “after all, the dead aren’t necessarily enlightened.” That statement gave us all a good laugh. In one way or another, the séance did affect us all. I’m not sure if anyone has gone from being skeptical to being a believer, but we were certainly all moved by the experience. Blithe Spirit begins previews next Wednesday, August 8; stay tuned for a blog from the designer run later this week. Tickets are available at calshakes.org/tickets or by calling 510.548.9666. The following was written by Box Office Manager Robin Dolan. Stay tuned for weekly dispatches from the Blithe Spirit rehearsal room! In Blithe Spirit, chaos ensues after a British couple hosts a séance in their home. I have a friend Medusa who leads séances, and has even created a beautiful Victorian parlor in her house for this purpose. While she and I were talking about the play, Medusa offered to do a séance for the actors. This is an introduction to that supernatural event. Doing psychic work is demanding. Being attentive to what other people are feeling and being supportive of them are absolutely central to the process. You also have to set the space so that, hopefully, something magical will happen. Medusa came early to our offices in Berkeley and, while waiting, did a tarot reading in the office. We looked at it together, and all signs pointed to a meaningful experience. We then went into the rehearsal hall to speak with the stage manager about how to set up the room. We set up a small table with a circle of chairs around it; Medusa had brought her own tablecloth, a photo of her grandfather, some candles, and the charms she uses while reading. We set these up, and she did some deep breathing to get herself centered. While the artistic team sat quietly on the other side of the room (surely wondering what in goodness’ name was about to happen) Medusa took my hand, and we ran around the table three times in order to draw a circle around the space: One draws a circle to create a special space, so that when one steps into the circle, it is as if you are entering a different world. Then I quietly left the room, and they began. We’ll be posting another entry soon from someone who took part in the séance. I’ve heard from several actors and the stage manager that it was both moving and interesting, and that it has influenced what they may do in the show. If you’d like to learn more about Medusa and her séances, she can be found online at facebook.com/MedusasParlor.